Runes are 24 Nordic symbols or letters in a set of related alphabets known as runic alphabets. Rune casting is one of the divination methods used to foretell the future. As per folklore, these runes have been passed on to mankind by the God of Norse Mythology Odin. The word ‘Rune’ means ‘mystery’ or ‘secret wisdom’. These symbols are engraved on stone, wood, in crystals and then these are used to answer a question. The major difference between runic alphabets and other alphabets is that letter (rune) has a meaning in its self. Therefore runes can be singularly or collectively read. 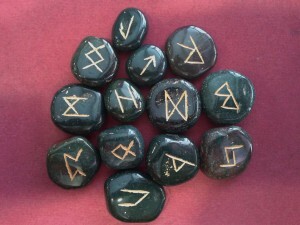 Runes were used by the people of northern Europe from the first century until well into the Middle Ages.